Chris Rock rules OK? 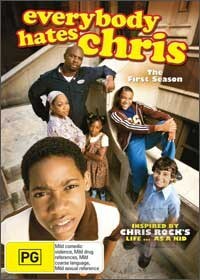 No exceptions, Chris Rock rules and this show inspired by his childhood does as well. If you have ever seen Chris Rock in action doing standup or in one of his various movie roles, then just imagine the same outlook on his childhood. This is the story of that childhood as remembered by Chris and is a mix of narration and action that shows the adventures that Chris has in his childhood. I think that one of the cool things about this series is the fact that it has a PG rating considering what a potty mouth Rock is in his adult comedy. This show is one that both adults and kids are going to have a real laugh at and Rock is so down to earth that you can relate to what happens to him. There are 22 wonderful episodes on this collection, spanning four DVDs. Also packed in are a deluge of extras rounding out the season and also giving you a good insight as to what goes into the making of Everybody Hates Chris. As a fan of Chris Rock I can totally attest to how good this show is, especially when you take into account the PG rating that it has. The style is very refreshing and filled with Rock's acerbic wit. Do yourself a favour and get this series now and prepare to have your funny bone tickled pink!